Rain at the Golden Fox is not in the way of world's best skier. 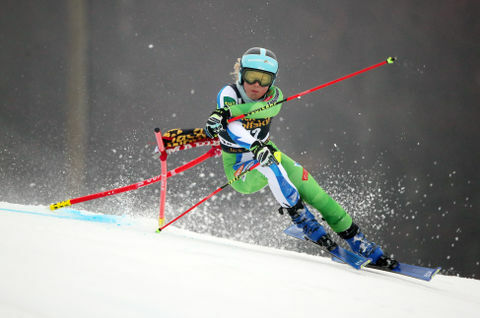 She won slalom gold in rainy conditions in 2015, won both races last year in rainy Kranjska Gora and she is confidently leading today's race in Maribor. Just like for Mikaela, rain is neither in the way of organizers. They prepared a hard and demanding racecourse. Mikaela Shiffrin: »It was tough, so I didn't have a feeling how fast I am until I reached the finish.« Best ranked Slovenian Meta Hrovat took 8th place: »It is a starting point. I need to fully attack in second run«. Among favorites for top places, we had a few surprises on icy racecourse as Viktoria Rebensburg and Federica Brignone did not qualify. 4.500 fans cheered for local Ilka Štuhec and she bravely attacked the racecourse where she achieved her best result in giant slalom two yers ago. Despite fog covering the upper part of racecourse, Ilka qualified for the final run: »I'm in and now I will try to rank higher«. Rain was also not disturbing members of Economic forum that took place in Partner tent this morning before first GS run.